Jacobs University Press Release about the disulfide mutants and the Tetramer Shop 🙂 enjoy! I was sorry to hear about the death of the molecular life scientist Sydney Brenner, who discovered frameshift mutations and who established C.elegans as a model organism. Beautiful text about Franziska Seeger who was a BCCB student at Jacobs, went on to the Baker lab (protein design) in Seattle, now joining Amazon… inspiration. Our lab alumna Maria Bottermann is moving to the Ragon Institute to be a postdoc there. She’s published a nice new paper in Cell Host&Microbe: Complement C4 Prevents Viral Infection through Capsid Inactivation. Congratulations Maria!!! Our lab alumnus Sunil Kumar Saini will be Assistant Professor at the Technical University of Denmark starting next month, he told us today. Congratulations Sunil and all the best wishes for your new endeavors! T cells are white blood cells of the immune system that have amazing properties: they can detect cancer cells and virus-infected cells in the body, and they can often even attack and eliminate such disease agents. This is why T cells are an important part of the immune response that a patient makes against tumors and viruses. Researchers from Jacobs University Bremen, led by Prof. Sebastian Springer, have now co-founded a company to sell reagents that help doctors and scientists track down T cells and determine what disease factors they can attack. When an immune response against a tumor takes place, the tumor-fighting T cells in the blood of the patient multiply. To find out how well a treatment is working, scientists and doctors want to check how many tumor-specific T cells there are. The tumor-specific T cells can be detected because they carry on their surface a so-called T cell receptor. The scientists use a so-called MHC protein, which binds to the T cell receptor, to color these T cells and observe them under the microscope or in a high-throughput machine called a flow cytometer. Already some years ago, Springer and his group constructed a super-stable form of the MHC protein by introducing a so-called disulfide bond. As a result, the MHC proteins are now stable without the little peptide and can be stored in their empty form. Just before use, the patient-specific peptide is then added. 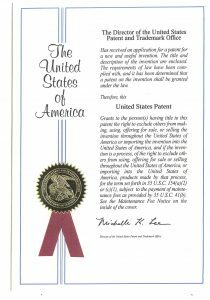 When Springer and his group saw the promise of this new technology, they filed a patent application. “Our colleagues at the Technical University of Denmark in Copenhagen then showed that the disulfide-stabilized MHC protein can be used in diagnostic procedures on patients”, says Springer. 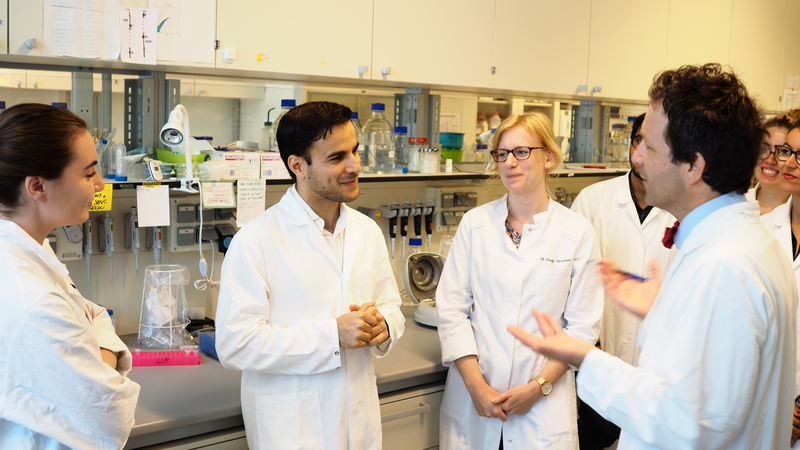 “Together, we then realized that we should set up a company to sell our new MHC proteins.” The new company, called Tetramer Shop (after the scientific name of the MHC protein reagents), opened on March 1st. Their customers are research and diagnostic laboratories worldwide, and the first orders have already been filled. The company is owned by the scientists who developed and validated the technology, and by Jacobs University. Here s the article in Chinese and in English (at least partially). The paper has a long history, way back to at least 2014 when Anca Apavaloaei did her summer internship in Adnane’s lab at Karolinska. She managed to crystallize H-2Kb with the GL dipeptide. Hers is Figure 1 and the first crystal structure of class I with a dipeptide! Congratulations Anca! The website of the Tetramer Shop went online! They are not yet taking orders (another few days) but you can look at it already. Happy New Year to all. There is a great new review on class I endocytosis by our lab alumnus Sebastián Montealegre: “Endocytic Recycling of MHC Class I Molecules in Non-professional Antigen Presenting and Dendritic Cells” (Front. Immunol., 07 January 2019; https://doi.org/10.3389/fimmu.2018.03098). Cindy and Sebastian organized, together with Gerhard Schütz and Eva Sevcsik of the Technical University of Vienna, the 682. 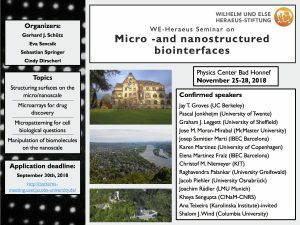 WE-Heraeus-Seminar on MICRO- & NANOSTRUCTURED BIOINTERFACES. 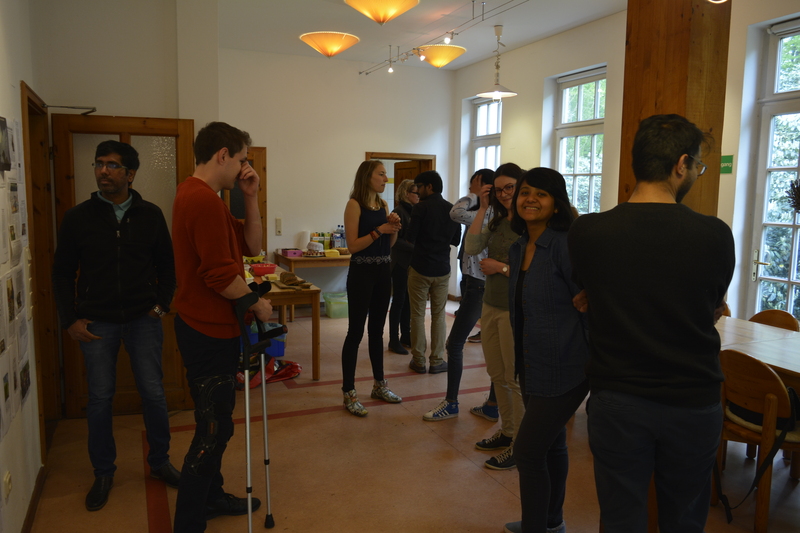 It was held at the Physikzentrum in Bad Honnef, close to Bonn. This turned out to be an excellent meeting with a lot of young people and very good discussions in the emerging field of structured biointerfaces. We hope that this will be the first in a series! The movie is here on YouTube. Enjoy! Jacobs University published a press release about Zeynep’s HLA-B27 paper. Read it here! Our lab alumnus Tudor Ilca has published a nice paper in PNAS, “Utilizing TAPBPR to promote exogenous peptide loading onto cell surface MHC I molecules“. Congratulations! The 14th September 1769 was for most people an ordinary Thursday. What they don’t know is that on this day the German scientist Friedrich Wilhelm Heinrich Alexander von Humboldt was born in a small castle near Berlin. His life was an outstanding journey through the miracles of our planet. A journey that brought him from the mines in Germany deep underground to the Chimborazo volcano in Ecuador several kilometers above sea level. A journey that let him discover the tiniest details and allowed him to connect them to the bigger picture. And most importantly, he knew that life doesn’t lose it’s magic when you dig into its most hidden secrets (like the function of MHC Class I proteins) – it just gets more fascinating (like MHC Class I proteins). Alexander von Humboldt combined profound theoretical knowledge with practical experience which he first discussed with experts in Paris, London and the United States and later shared with the public all over the world. Not all of this methods are up-to-date, but we can still learn a lot from him, especially one thing: the fascination for the overwhelming beauty of nature. Cindy’s new paper on micropatterns has been published in eLife! Congratulations Cindy and all coauthors! We have a press release and a movie that we will share in a few days. We congratulate our lab alumna Maro Iliopoulou on the occasion of her first-author paper in ‘Nature Structural and Molecular Biology’, entitled “A dynamic three-step mechanism drives the HIV-1 pre-fusion reaction“. Super achievement! Here is the new poster of our conference ‘Micro- and nanostructured biointerfaces’. Download it here! Here is the new Jacobs University press release on the microcapsule paper by Sujit, “Comparative validation of a microcapsule-based immunoassay for the detection of proteins and nucleic acids“. I am deeply impressed by the feature article “Losing Earth: The Decade We Almost Stopped Climate Change” in the New York Times Magazine. If the climate catastrophe is almost inevitable, then our first and foremost duty – besides activism – is to train the next generation of students in thinking scientifically so they do not fall victim to the manipulation tactics of industry and the selfishness of politicians. I came across this through the article “Die Katastrophe hätte verhindert werden können” (German) in SPIEGEL. Here is another perspective on climate change: “The Uninhabitable Earth” from the New York Magazine. And here is another slightly more positive view from the Guardian: “Don’t despair – climate change catastrophe can still be averted“. The impressive article “Bald gibt es kein Zurück mehr” (German) in Die Zeit. Our manuscript (first author: Zeynep) “Distinct mechanisms survey the structural integrity of HLA-B*27:05 intracellularly and at the surface” appeared online! Our manuscript “A two-hybrid antibody micropattern assay reveals lateral interaction between MHC I heavy chains at the cell surface” (first author: Cindy Dirscherl) was accepted by the journal, eLife. Thank you Cindy and coauthors for years of hard work, and congratulations! 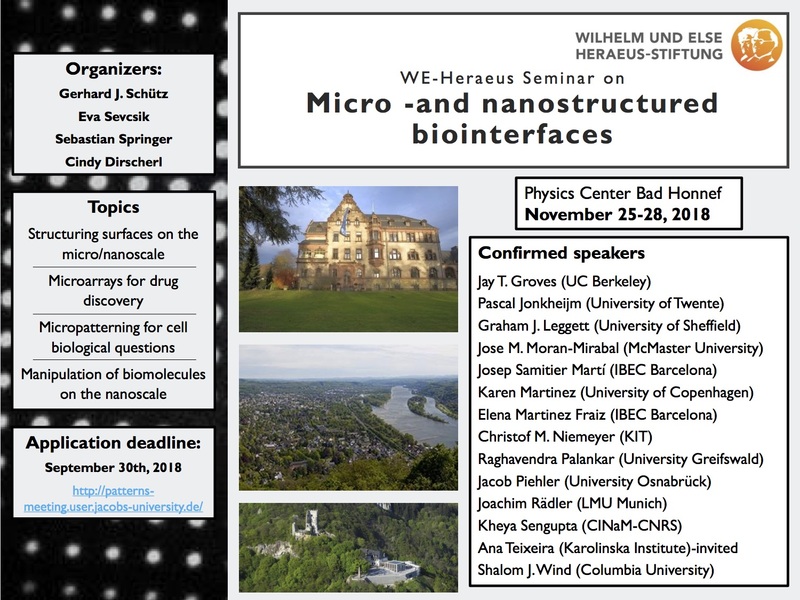 Cindy and I, together with Gerhard Schütz and Eva Sevcsik from Vienna, are organizing a conference on the same topic, micro- and nanostructured biointerfaces, in the Fall of this year. The registration is open now. See here for information. 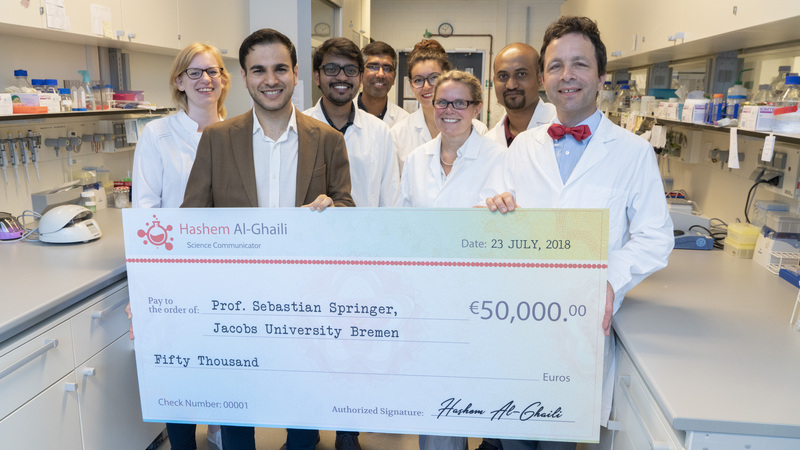 Our Master program alumnus, Hashem al-Ghaili, who runs the ScienceNaturePage on Facebook, has today donated € 50,000 to our laboratory. Thank you very much! To celebrate, there was an event where both of us gave speeches. Hashem’s Facebook post on the event is here, and his speech is here. The text also got published on LinkedIn. I found it very touching. Jacobs university also brought an article on their webpage. I totally forgot to mention here that Jacobs University had a really nice article on their website on our lab alumna Catherine Jacob-Dolan going to Harvard. Here it is. Catherine is also an author on an eLife paper from us. We miss you Catherine! Our manuscript (first author: Sujit Kumar Verma) “Comparative validation of a microcapsule-based immunoassay for the detection of proteins and nucleic acids” has been accepted by PLOS ONE. Congratulations Sujit and coauthors! Ask us for a preprint! Our manuscript (first author: Zeynep) “Distinct mechanisms survey the structural integrity of HLA-B*27:05 intracellularly and at the surface” has been accepted by PLOS ONE. Congratulations Zeynep and coauthors. 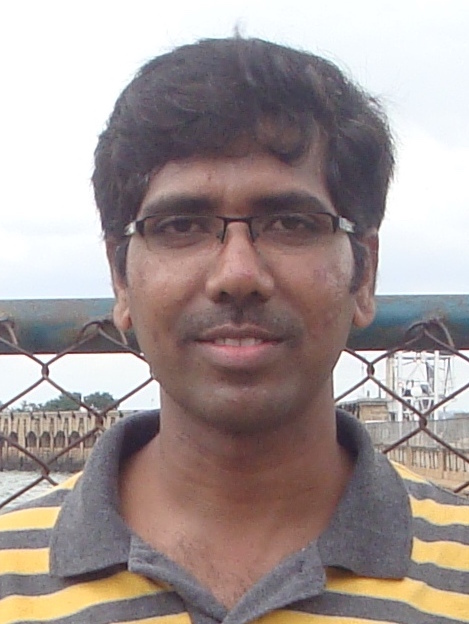 Our now-alumnus Venkat Raman Ramnarayan is at the Lindau Nobel Laureates’ meeting. Greetings and good success with your discussion projects! 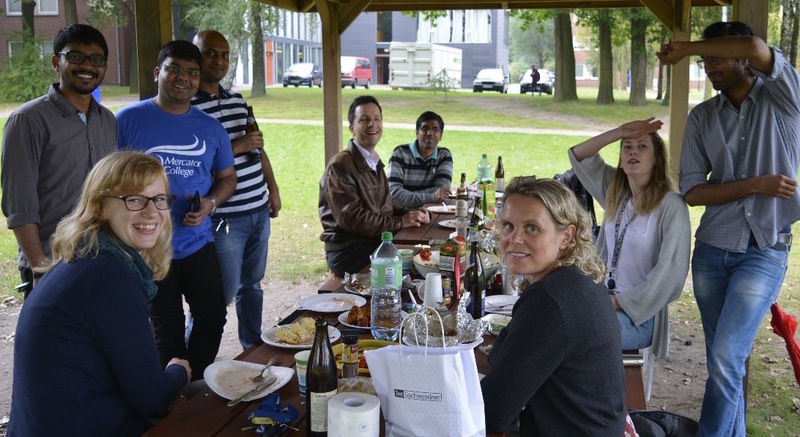 Also Venkat thank you very much for the fantastic work done here in six years, and all the best for your future in Blanche Schwappach’s lab in Göttingen! Also: Today on the Jacobs webpage is an article about Venkat’s Cell Reports paper! Our new paper, “Cytomegalovirus gp40/m152 uses TMED10 as ER anchor to retain MHC class I“, by Venkat Raman Ramnarayan and collaborators, has been accepted by Cell Reports. Super 🙂 and just in time for Venkat’s defence next Monday! Some pictures from our first-ever science creativity workshop today – it was so much fun! Cindy Dirscherl defended her PhD thesis “Antibody Micropatterns as a tool to study MHC class I molecules” with a distinction today! Congratulations! Our external examiner was Gerhard Schütz from Vienna. Our new manuscript, “Cytomegalovirus gp40/m152 uses TMED10 as ER anchor to retain MHC class I”, by Venkat Raman Ramnarayan and collaborators, has been accepted by Cell Reports. Ask us for a preprint! 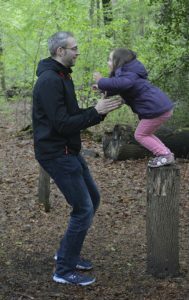 Picture from our May Picknick – thank you to all who came, it was a great party. We have not one but two PhD defences coming right up: Cindy on June 1, and Venkat on June 11. Both very exciting stories I think. Everyone is invited! I am in Berlin at the concluding conference of the DAAD “Leadership for Syria” program. 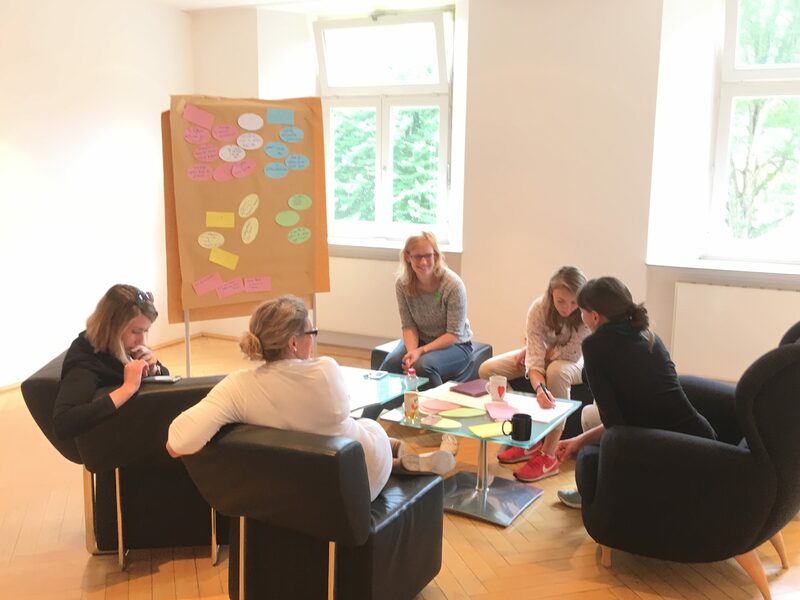 It is so good to see the progress of the 220 students that we selected three years ago to do their Master and PhD degrees in Germany. I hope that one day, soon, they will be able to help rebuild their country. Respect to the Auswärtiges Amt and to DAAD for financing and organizing. Congratulations to our lab member and BSc thesis student Catherine Jacob-Dolan on being admitted to the Immunology grad program at Harvard! We know you will do extremely well there. I was sad to hear that Hellmuth Möhwald passed away. He was the pioneer of polyelectrolyte microcapsules (and a lot of other things). We learnt from him through his former student, Tatiana Kolesnikova. I remember presenting our microcapsule plans to him at the Max Planck Institute in Golm, in 2011. Happy Pi Day everyone! The best Pi Day activities are at the Exploratorium in San Francisco: https://www.exploratorium.edu/pi/ They invented Pi Day, after all. 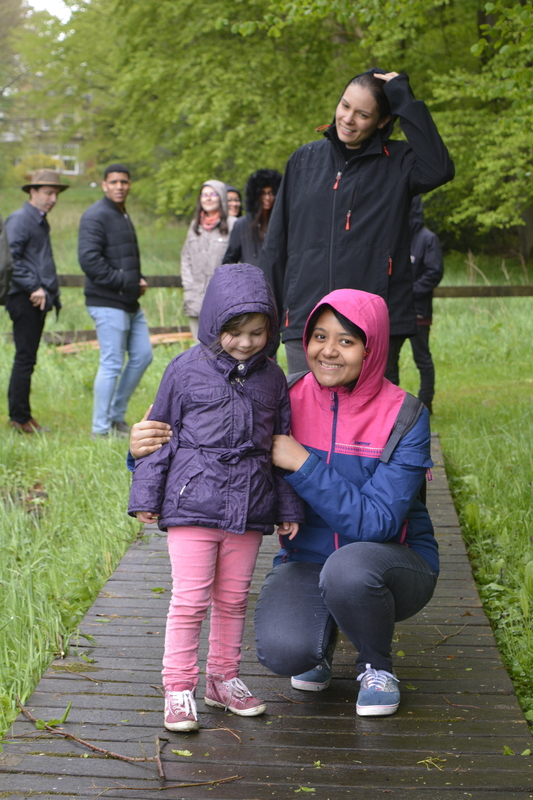 And: congratulations to our lab member Evi Zhuleku on admission to the Göttingen Molecular Biology graduate program! I was sad to hear that Günter Blobel has passed away. He was one of the true giants of molecular cell biology, the discoverer of topogenic sequences in proteins. I applied to him for a postdoc position in 1996 and I remember spending a whole Sunday afternoon in his office at Rockefeller, and presenting my job talk to him alone. We ate from a big basket of oranges that he had brought from the market. I ended up not taking his offer but went away deeply impressed by the personality. Our friend Jon Yewdell at NIH has written a great book about science: “Truth Wins”. It is an account of his own scientific career, with (in a second chapter) a lot of advice to people considering a scientific career. He has made it available for free, it is really worth reading. 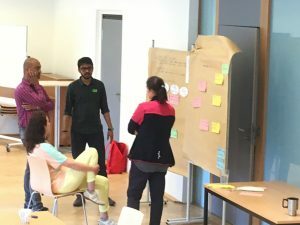 Read the full story on the web page of the Schöntal meeting. I’d like to say congratulations to our alumna Anca-Sarmiza Gueltekin-Tigan and her husband Sinan on the occasion of the birth of their first child, Ilinca Yagmur. All the best wishes! On Tuesday, November 21, there is a partnering event with the life sciences industry of the Bremen region at Jacobs University. I’m giving a talk about microcapsules. Everyone is invited, here is the link. ampé lab: “Structure of the human MHC-I peptide-loading complex“. Very important for us. Congratulations! Our alumna Dr. Susi Fritzsche ist starting work with the biotech company Sysmex in Görlitz today. Congratulations on your job, Susi! and good beginnings! Ruben Hohnholz, our external PhD student with Tilman Achstetter at Hochschule Bremen, just published his second paper, “Impact of plasmid architecture on stability and yEGFP3 reporter gene expression in a set of isomeric multicopy vectors in yeast“. Congratulations!! 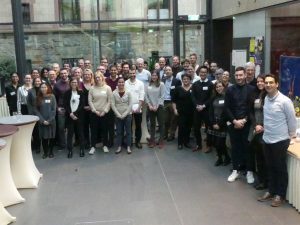 Congratulations to our lab alumna, Cynthia Wright Drakesmith, for taking up science again in the group of Enzo Cerundolo at Oxford University. Today in the magazine Science, two very important papers appeared by Robert Tampé and by David Margulies that solve a problem that many (including us) have thought about and worked on for a long time: the crystal structure of a class I molecule with a peptide editing chaperone. Thank you to both groups for illuminating this, I am very impressed and happy. The Margulies group have used our technique of dipeptide-induced class I refolding to obtain their partially empty class I molecule. On October 19, I am giving a popular science talk in German, in the Bürgerhaus Vegesack, entitled “Wie das Immunsystem sich gegen Krebserkrankungen wehrt“. Everyone is invited! For details, see the Jacobs announcement page. Our alumnus Binyam Mogessie (BCCB class of 2007), who is now at the Max Planck Institute in Göttingen and soon going to set up his own lab in Bristol, is visiting today and giving a talk. Well done Binyam and congratulations on your job! 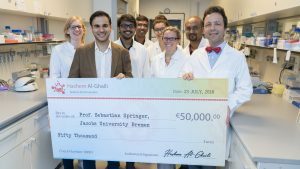 Jacobs Students elected me ‘Professor of the Year 2017‘ – thank you! 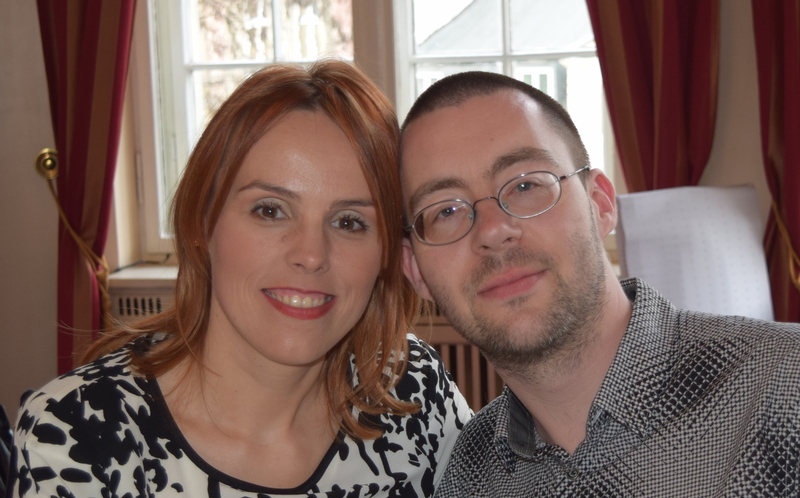 Congratulations to our lab alumnus Brieuc Delcommenne on the occasion of completing his MSc degree at the University of Namur! 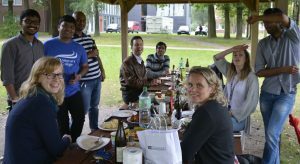 Here’s a snapshot from our Lab BBQ yesterday. Our new review article “Protein micropatterns printed on glass – novel tools for protein-ligand binding assays in live cells” got accepted by Engineering in Life Sciences. It describes the opportunities and also the pitfalls when adapting micropatterning technologies for the study of protein-protein or protein-ligand interactions, from the point of view of a cell biologist – that is, our experiences over the last few years 🙂. Ask us for a preprint! How can science be published more fairly? An older article in the Guardian (December 9, 2013) about Randy’s original refusal to publish in Cell, Nature, Science, and similar journals:”Nobel winner declares boycott of top science journals“. 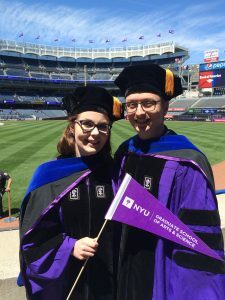 Our postdoc alumna Tatiana Kolesnikova has finished her contract. Thank you for your hard and successful work (see our publication list) on the biotechnology project, and all the best for your future career! Last day at work for Gayane Kiragosyan (going off to Sysmex for an internship) and Brieuc Delcommenne (going back to Université de namur to finish his M.Sc.). Thank you for all your hard work, for the good cooperation in the team, and all the best for your future endeavors! 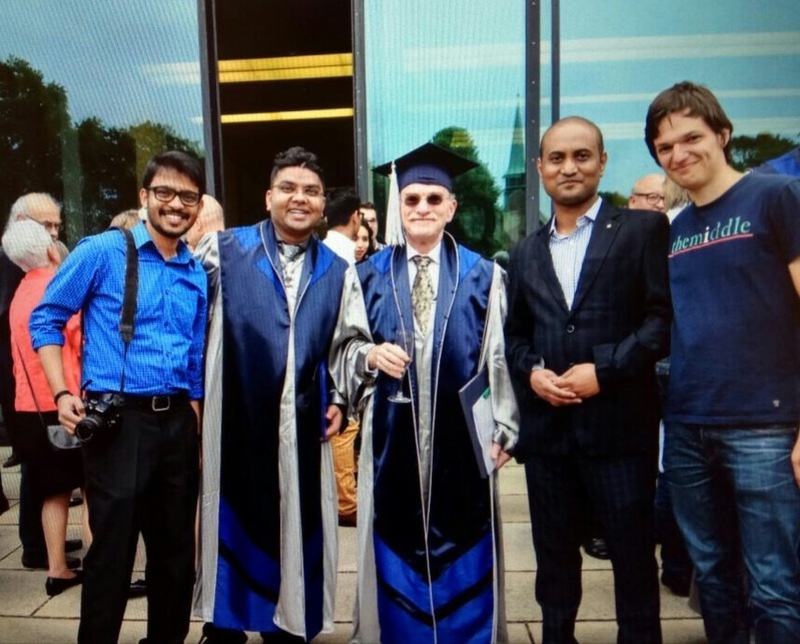 Our PhD student Sujit Kumar Verma also graduated, and he is continuing as a postdoc in Matthias Ullrich‘s lab. Congratulations, and all the best for future paths! Congratulations to our alumni Stela Sota, Ana Paz, and Jorge Guajardo who graduated last week! Thank you for all your hard work inside and outside the lab, and all the best of success with your future efforts. And: keep in touch! I am very happy and grateful for a beautiful graduation. On Thursday, June 8, we had a panel discussion with Bernd Pulverer, the editor of the EMBO Journal; Gerard Meijer of the Fritz Haber Institute of the Max Planck Society; and Randy Schekman, the cell biologist and Nobel laureate, Sebastian’s mentor in Berkeley. 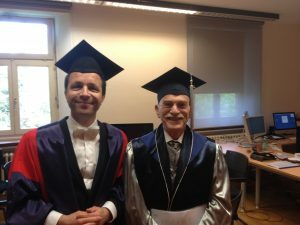 Randy was awarded an honorary doctorate by the university. About the panel, a summary (https://www.jacobs-university.de/news/sharing-scientific-knowledge) and a video abstract (https://www.youtube.com/watch?v=WL2zScad5pA). 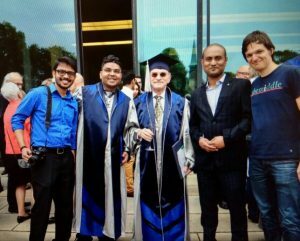 A general story about our graduation (https://www.jacobs-university.de/graduation-2017-media) and Randy’s speech (https://www.youtube.com/watch?v=8tDDUBNlJvs&t=223s). Thank you very much to our visitors, and to all those here who made this dream come true. We’re excited to host Randy Schekman for several talks on campus in the coming week. To prepare, check out his many videos on YouTube! From this week on, our alumna Linda Janßen works for the Peprotech company. Meet her at the Hannover Biotechnica at Stall A74. Good luck with your endeavors Linda and lots of success!! Today, we are on the front page of the Jacobs University website with an article on recombinant class I and peptide exchange. Our former MoLife Master program alumnus Hashem Al-Ghaili was featured very prominently in newspapers this week. I’m very impressed! Tatiana Kolesnikova’s new paper, “Protein A-functionalized polyelectrolyte microcapsules as universal platform for enhanced targeting of cell surface receptors”, has been accepted by ACS Applied Materials & Interfaces. Congratulations! 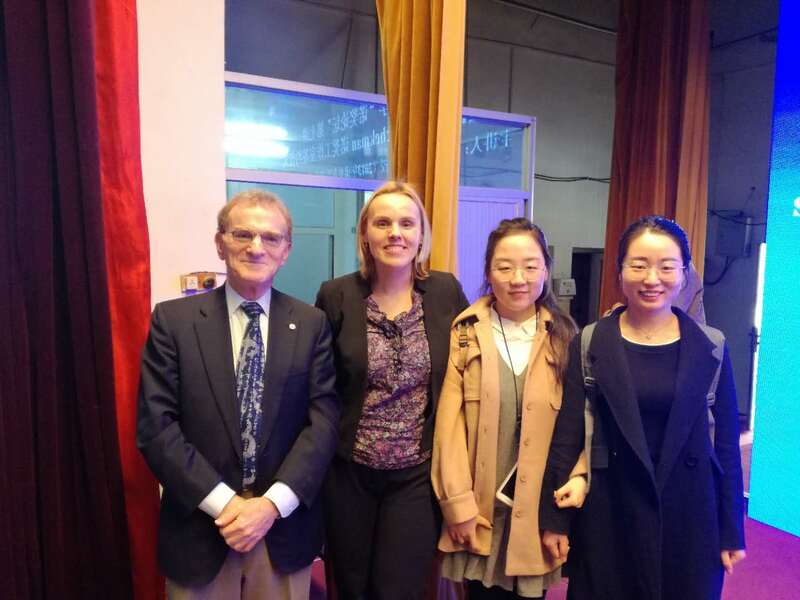 I heard that our alumna, Gosia Garstka, Professor in Xi’an, now got her first Chinese grant. Congratulations Gosia! 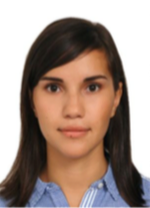 Our lab member Andreea Felea received an offer for a summer internship at the IMBA. Congratulations! Our lab member, the undergraduate Catherine Jacob-Dolan, received an Amgen scholarship to work in Cambridge in the coming summer. Congratulations Catherine! 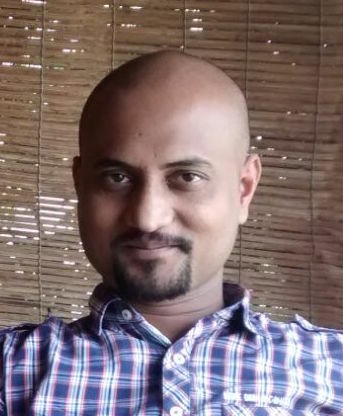 Our lab member Sujit Kumar Verma received an offer for a postdoctoral fellowship in Matthias Ullrich’s lab here for the time after his graduation. Congratulations Sujit! Our lab alumna Meike Aßmann told me that she graduated from Oxford (Simon Davis’ lab) in December already. Congratulations Meike DPhil! I would like to point out to everyone the Jacobs Career Fair on February 22nd. No matter who or where in your career you are, it’s a good idea to go! 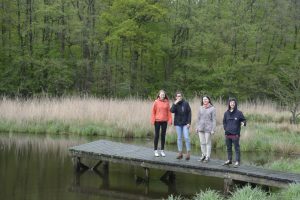 Tilman Achstetter and Ruben Hohnhorst (our external PhD student at Hochschule Bremen) have told me that their first paper together has been accepted by Yeast: “A Set of Isomeric Episomal Plasmids for Systematic Examination of Mitotic Stability in Saccharomyces cerevisiae”. Congratulations! Our new paper “Specific Capture of Peptide-Receptive Major Histocompatibility Complex Class I Molecules by Antibody Micropatterns Allows for a Novel Peptide Binding Assay in Live Cells” has come online. Enjoy and/or let us know what you think! I heard in December already that our alumna, Dr. Sinan Zhu, will take up a new job as a clinical data analyst at Columbia University. Congratulations Sinan on your transition into data science! Our new paper “Specific Capture of Peptide-Receptive Major Histocompatibility Complex Class I Molecules by Antibody Micropatterns Allows for a Novel Peptide Binding Assay in Live Cells” got accepted by Small. It’s one of the results of Cindy Dirscherl’s PhD work. Congratulations Cindy! Ask us for a pre-print if you are interested. I totally forgot to mention earlier this year that our lab alumna Jood Hashem became an Assistant Professor in the Medical Laboratory Sciences Department at the Faculty of Applied Medical Sciences of Jordan University of Science and Technology. Congratulations Jood! and all the best for your endeavors. Congratulations to our lab member Daria Ivleva on passing her Master defence! Daria studied in the Technical and Applied Biology program at the City University of Bremen and worked with us for about a year. She was involved in the class I endocytosis project. All the best Daria for your next steps! We remember Stefan Jentsch who passed away last week. Stefan was a director at the Max Planck Institute for Biochemistry in Tübingen. After his postdoc with Alexander Varshavsky, he isolated the first ubiquitin conjugating enzymes from yeast and made very important contributions to the understanding of the big role that the ubiquitin system plays in protein degradation and in the supervision of the integrity of the genome. Stefan was the supervisor of Sebastian’s diplom (MSc) thesis at the Max Planck Institute in Tübingen. As a student, I loved Stefan’s anarchic and irreverent spirit, in science and life. In Tübingen, someone had hung up a poster in the hallway, showing a beautiful mountain lake in Switzerland. One day, I watched Stefan cut out from Post-It notes the parts of a giant sea snake monster and attach it to a corner of the lake, so people would see it at the second glimpse. At the time, it was shocking to me that a Professor would do such things. Stefan – you continue to inspire me to this day :-). Thank you. 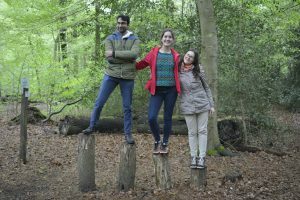 I would like to congratulate our lab alumna Patrycja Kozik (BCCB class of 2004) on taking up her position as a Research Group Leader at the MRC Laboratory of Molecular Biology in Cambridge. She will work on antigen presentation through MHC class I in dendritic cells. All the best wishes for your research, Patrycja! 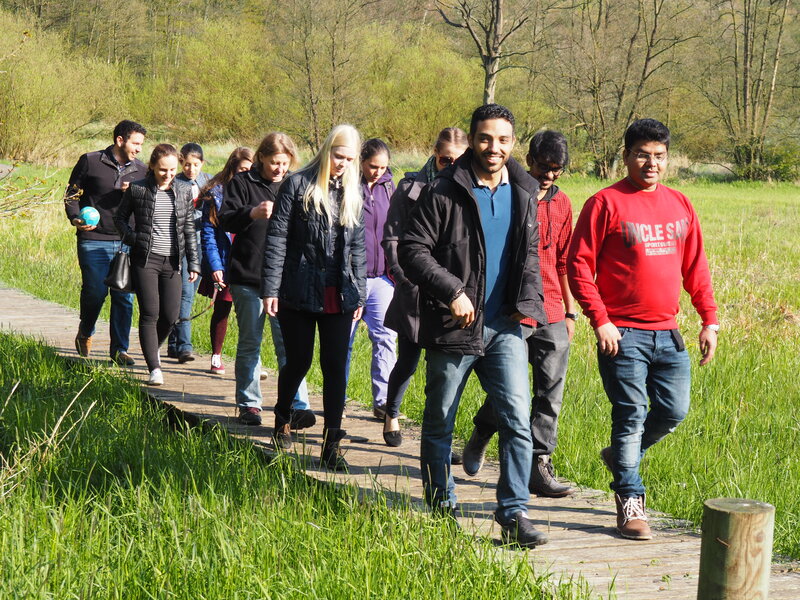 We have a number of lab members leaving at the end of the academic year. Mohamed Aboelmagd has received his MSc and is moving back to Dubai to work. Julia Heinze has received her BSc and is moving to Heidelberg for an MSc. Maro Iliopoulou has received her MSc and is now going to Oxford for an internship. Maria Iossifidou has received her BSc and is now going to Cambridge to start her PhD in the lab of Louise Boyle. 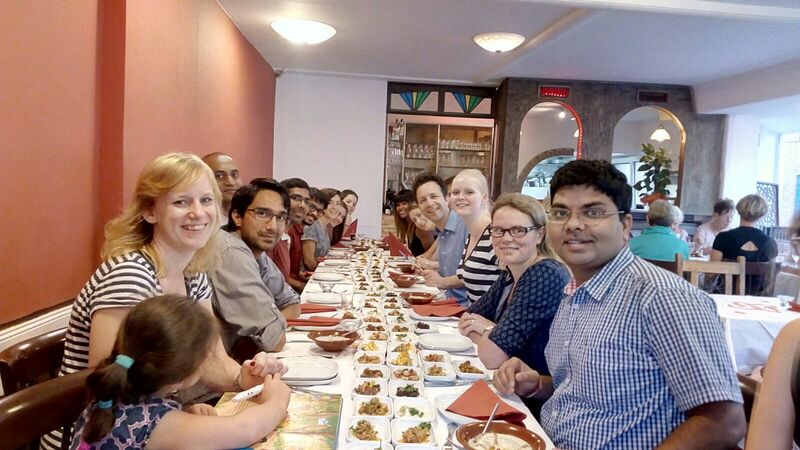 One lab picture from the recent dinner at the Syrian restaurant Nayla in downtown Bremen… very good food and company. 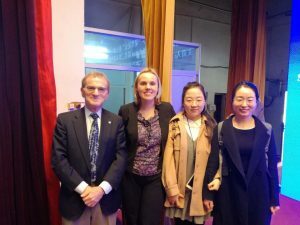 Our lab alumna Gosia (Małgorzata) Garstka started her own group as professor at Xi’an Jiaotong University. Congratulations, Gosia, and lots of success with your endeavors! Welcome to our new lab member Danielle Hart! She is a third-year medical student, and she comes as a placement or project student from Southampton University Medical School for three months. 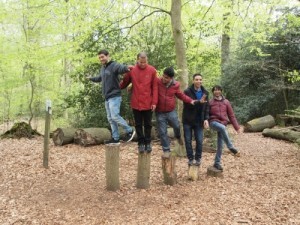 Welcome to our new lab members Ankur Saikia and Raghavendra Anjanappa! 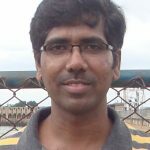 Ankur holds an MSc degree in Molecular Biology and Biotechnology from Tezpur Central University, Assam, India, and since 2005, he has worked in assay development in various companies in India. Raghavendra holds an MSc degree in Biochemistry from Kuvempu University, India. 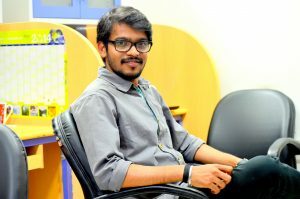 Since 2005, he has been a Junior Research Fellow at University and a researcher in biotech companies in India, mostly working on protein purification and microbiology. Our lab member, Mohamed Aboelmagd, has passed his MSc thesis defence. Congratulations Mohamed! Our lab member, Maro Iliopoulou, passed her MSc thesis defence. Congratulations! Today is Nikolett’s last day with us. She was working on a cell patterning project with Cindy – you will read about it in an upcoming publication. Thank you very much Nikolett for the hard and successful work! Our new paper “To Catch or not to Catch”: Microcapsule-Based Sandwich Assay for Detection of Proteins and Nucleic Acids” has appeared online. Congratulations to all who were involved, and thanks for the BMBF for funding the work. Congratulations to the members of the lab graduating today: Linda Janßen (PhD); David Aleksov, Fiona Harnischfeger, Julia Heinze, Maria Iossifidou, Leona Kovac (BSc). All the best for your future careers! I would like to say congratulations to our lab alumna, Nadine Bode, for graduating from NYU with a PhD! Welcome to a new lab member: Nikolett Nagy, who graduated from the University of Strathclyde with a BSc(Hons) in Immunology and Pharmacology. She will stay with us for some months on an Erasmus fellowship. Our new paper ““To Catch or not to Catch”: Microcapsule-Based Sandwich Assay for Detection of Proteins and Nucleic Acids” got accepted. It is about the creation of a novel assay that uses polyelectrolyte microcapsules for the detection of soluble analytes. It was sponsored by the BMBF Bioeconomy 2020+ initiative. Look for it on the publications page, and/or ask us for a preview! Congratulations to our lab alumna Gosia Garstka on the occasion of her wedding with Marcus! Welcome to our newest lab member, Swapnil Ghanwat. 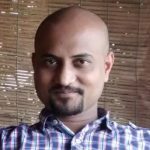 Swapnil holds an MSc in Biotechnology and has five years of research experience from the International Centre for Genetic Engineering and Biotechnology in New Delhi. He will work as a PhD student on the mCMV gp40 project. Welcome! 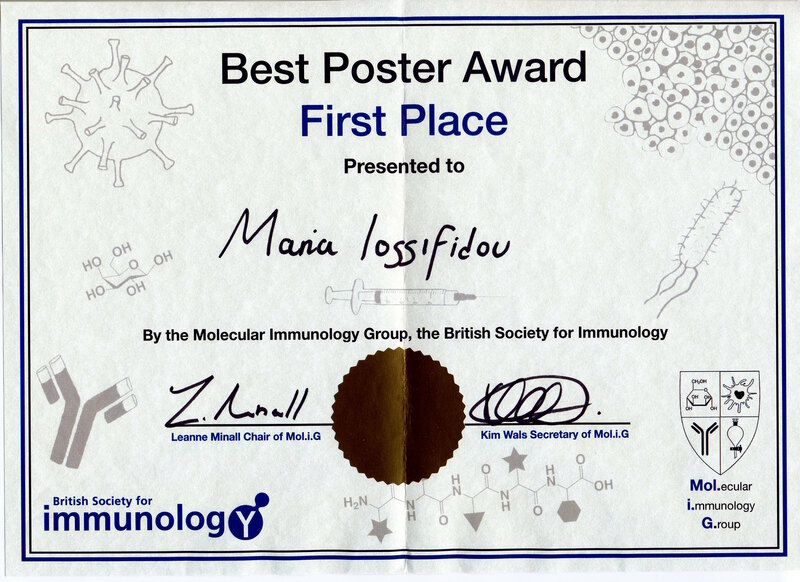 Our lab member Maria Iossifidou got the best poster prize at the Oxford meeting for Chemical Immunology. Congratulations! Our crystallography collaborator Stéphane Boivin is leaving EMBL DESY to move to Grenoble. All the best with your future work! Two new people are joining the group today: Natalia Lis and Gayane Kiragosyan. Welcome! 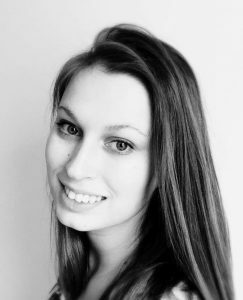 Natalia has an MSc in Medical Biotechnology from Gdańsk University. She works on the mCMV gp40 project as a PhD student. Gayane has an MSc in Ecology. She works on the Microcapsules project as a project scientist. 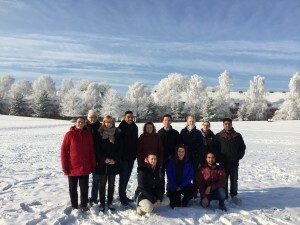 Group picture in the snow from yesterday! We are advertising a PhD position in biochemistry and cell biology. See here. Spread the news! Congratulations to our lab alumni Esther Ghanem and Mohammed Al-Balushi for publishing their paper “Adopting the rapamycin trapping assay to track the trafficking of murine MHC class I alleles“. All the best wishes for the holidays and for the New Year to our alumni, friends, and colleagues. The Jacobs University press release for the paper “The murine cytomegalovirus immunoevasin gp40 binds MHC class I molecules to retain them in the early secretory pathway” by Janßen et al. was published. Enjoy! Congratulations to our lab alumnus Sunil Kumar Saini and his wife Tripti on the birth of their daughter Aadya! Our lab member Venkat Raman Ramnarayan appears on the front page of the ‘Bremer Arbeitnehmer Magazin’ November 2015 with a small story. Congratulations! Our new paper by Janßen et al. is online! Our lab member Linda Janßen passed her PhD defence with distinction. Congratulations! Hartmut Hengel from Freiburg was the external member of the thesis committee. Our paper, “The murine cytomegalovirus immunoevasin gp40 binds MHC class I molecules to retain them in the early secretory pathway”, was accepted by the Journal of Cell Science. 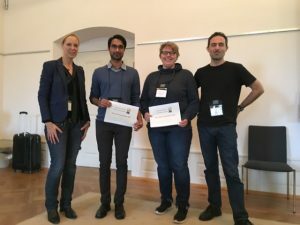 The authors are Linda Janssen, Venkat Ramnarayan, Mohamed Aboelmagd, Maria Iliopoulou, Zeynep Hein, Irina Majoul (Cell Biology, Lübeck), Susanne Fritzsche, Anne Halenius (Virology, Freiburg), and Sebastian Springer. Ask us for a preprint! Our paper “Mechanistic Basis for Epitope Proofreading in the Peptide Loading Complex” was accepted in the Journal of Immunology. This is a study run by Robert Tampé in Frankfurt on HLA-B44 allotypes and their interactions with the peptide loading complex. Clemens Schneeweiss, when he was in our lab, generated cell lines for it and did some experiments. If you are interested, ask Robert Tampé for a preprint. Our paper “The carboxy terminus of the ligand peptide determines the stability of the MHC class I molecule H-2Kb: a combined molecular dynamics and experimental study” was just published online in PLoS ONE. Enjoy! Our paper “The carboxy terminus of the ligand peptide determines the stability of the MHC class I molecule H-2Kb: a combined molecular dynamics and experimental study” (Esam T. Abualrous et al.) was accepted in PLOS ONE. Congratulations Esam and all who worked on it! Thank you to Daria for her hard work during her lab rotation with us. She will return in September for her MSc thesis! A page on Amanda at the Linda Nobel Laureate meeting was published on the Jacobs website. Congratulations Amanda! Esam Tolba Abualrous, Ph.D. (Physics) has started his postdoc in the lab of Frank Noë in Berlin. Sebastián Montealegre, Ph.D. (Biochemistry) has started his postdoc in the lab of Peter van Endert in Paris. Congratulations, lots of success, and stay in touch! Our lab member Amanda Amoah is featured in the ‘Junges Africa‘ blog page of the ARD-alpha blog. Congratulations to lab members Anca Apavaloaei, Tudor Ilca, Michael Scherm on their BSc graduation today. Our lab member Esam Tolba Abualrous passed his PhD thesis defence with distinction. Congratulations! The title of the thesis is “Molecular mechanism of peptide binding to MHC class I molecules in the cellular context”. It’s mostly found in the papers of which he is a coauthor, and in one other manuscript that is in revision, and that will hopefully appear soon. Welcome to Daria Ivleva from Hochschule Bremen for a two-month lab rotation. Look at the webpage of the Bremen Life Sciences Meeting 2015 for some great pictures of the event! Our lab member Amanda Amoah passed her Master thesis defence. CONGRATULATIONS AMANDA! Our Master rotation student Radhika Dhekane is returning to University of Bremen. All the best for your studies! Our guest student Natalia Lis is returning home to Poland. Thank you for everything and all the best wishes! Our lab member Sebastián Montealegre passed his PhD defence. Congratulations Dr. Montealegre! 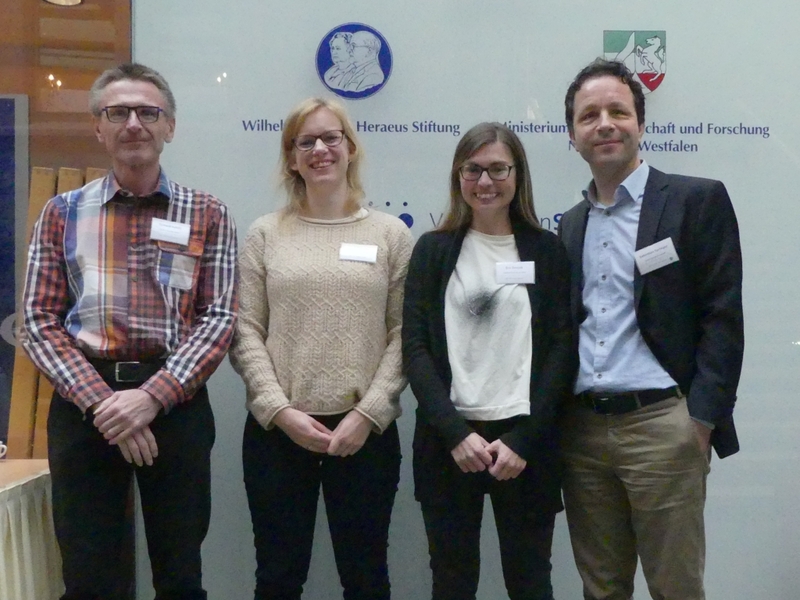 Our former lab member Jenny Baum has started her new job with the Deutsches Milchkontor. Congratulations! We made a video abstract for our new paper, “F pocket flexibility influences the tapasin dependence of two differentially disease-associated MHC Class I proteins“. Enjoy! Our new paper, “Dissociation of beta-2 microglobulin determines the surface quality control of MHC class I molecules”, was accepted by the FASEB Journal. Ask us for a preprint!. Our lab member, Amanda Amoah, was selected to attend the 65th Lindau Nobel Laureate Meeting. Congratulations! Amanda is already the fifth member of our lab to go to a Lindau meeting, after Patrycja Kozik, Rakina Yaneva, Susi Fritzsche, and Sunil Kumar Saini. Our alumnus Dr. Sunil Kumar Saini starts today as a postdoc in the laboratory of Sine Hadrup in Copenhagen, and our alumna Dr. Susi Fritzsche starts today as a postdoc at the Max Planck Institute for dynamics of complex technical systems in Magdeburg. Congratulations and success with your work! Our new paper “F pocket flexibility influences the tapasin dependence of two differentially disease-associated MHC Class I proteins” is now online in the European Journal of Immunology. 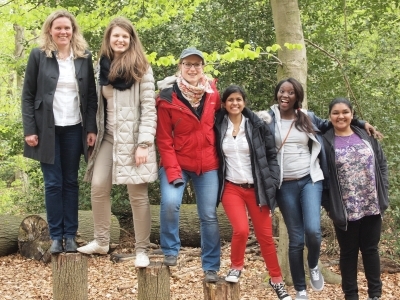 Our alumna Dr. Susi Fritzsche is leaving to take up a postdoc position at the Max Planck Institute for Dynamics of Complex Technical Systems in Magdeburg. Congratulations and good luck! Our new PNAS paper was published. Read the press release! Our new paper “F pocket flexibility influences the tapasin dependence of two differentially disease-associated MHC Class I proteins” was provisionally accepted by the European Journal of Immunology. It is about the molecular properties of the disease-linked class I allotype HLA-B27. Ask us for a preprint!